So you may ask, where can one find a place with new and used restaurant equipment in New York City? If you Google used restaurant equipment NYC, a bunch of options come up! I for one didn’t even know that you can find these specific stores in New York City, especially since everything is online these days. Lets say you want to go in person and talk to someone face to face, here in in New York City…well its possible! It was only until I was walking around my neighborhood in Lower East Side when I noticed large amounts of restaurant equipment stores. They were located on Bowery street (right off of East Houston), and many of the stores I noticed both buy and sell new and used restaurant equipment. So if you are searching for used restaurant equipment NYC, some of these can be a good option. 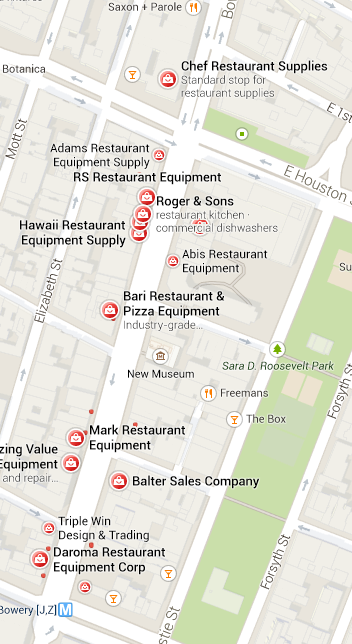 As you can see there are tons of stores on Bowery Street that buy and sell restaurant equipment. Having a large amount of stores is probably a good thing and I wouldn’t be surprised if you could make a good deal with a restaurant equipment purchase or sale. Below I included a map so you can see where these stores and others are located. Thanks for mentioning us on your blog. Please update Mark’s Restaurant Equipment (old name from years ago) to Sammy’s Restaurant Equipment. Also, the building at 210 Bowery was sold and we moved to 212 Bowery. Thank you. Your blog its very good and we are also having similar website you can visit us. Thanks, I’ll check it out…feel free to post an ad advertising your equipment! I’m sure our users would appreciate it. I really like your post. I am so glad. We moved again! We were previously at 210/212 Bowery. We’re now @ 967 Atlantic Avenue, 2nd floor, Brooklyn, NY 11238. Please update our listing above. We appreciate that we’re on the list! Thanks. Hi Mandy – wondering if you sell things like knives, cutting boards, canning cars etc. or just big equipment. Looking for used or new restaurant equipment: cooler for sushi and beverages; charcoal grill; cash register; freezer; food warmer display glass cabinet; small tables and chairs. We are going to open a new Grill Plus Restaurant in Parsons Blvd Corner Hillside in Jamaica, Queens, NYC. Conrad, we may have some of the things you’re looking for. 609 4th Ave Brooklyn. All free for the taking, located in Park Slope Brooklyn. open to negotiations, located in Manhattan, ground floor easy to move. Currently selling the following, all in amazing working condition. This blog is really helpful. great jo. Thank you. I am looking for a 36″ flat top gas grill used. If someone has it , please contact 908 504 1970. I am looking for lot of other restaurant equipments too. any help wlll be appreciated. -220v bain marie 6 soups bar , with adjustable temperature. -110v low boy (perfect for sandwich making, or serving toppings for ice cream, with opening up/down door and vertical door underneath storage. – 2 stacked warmers drawers staintess steel, either under or above counters, humidifier, to keep your rolls or hot soups sandwiches prepacked ready to be sold warm, adjustable temperature. – high marble top table with high black stool 2 sets, perfect for coffee shops or bars. – misc pots and pans. Would prefer single buyer , someone opening a cafe, bakery , ice cream , soups establishment,for potential buyer to get best deal. Item per item ok, but nothing is for free and we dont deliver, sales are final , cash or credit card, pick up only no exception!! Great deal for new entrepreneur opening food store, 1/4 of purchased prices..big savings are always good for start ups. I’m opening a bakery cafe February 2018 and I’m looking for some used and some new equipment. 2- sliding door merchandize refrigerators 54″ x 30 x 83, 1 Freezer single door stand up, Proof box, lowboy fridge, and some other equipments. Anybody know where I can get good prices text me 646-531-2972. Hello, do you have anything of the equipment left behind. let us know. I’m surprised not to see Kitchenall on this list. https://www.kitchenall.com . We pride ourselves on having the lowest prices anyone will find for commercial restaurant equipment. This is not a boast, please see for yourself. And all equipment delivers free. I hope you’ll consider us. I have a large set of commercial exhaust fans for kitchens for sale! Sizes ranging from 8 inch-30 inch! 115 v and 220 v! Priced and ready to move. Pick up in Manhattan. Call 212-226-0575! EVERYTHING MUST GO FROM THE LIGHT FIXTURES ON THE CEILING TO THE REFRIGERATION UNITS.